My balms get a lot of play during cold weather, and there’s nothing more satisfying than cracking open a new jar of mint condition face balm — especially when you’re opening a new-to-you brand. Metta Skincare’s Face Balm has been in rotation both on my face and my boyfriend’s, and it’s one I keep going back to because I like the ritual of applying it. As you can see in the image below, Metta Skincare’s Face Balm appears dense and solid when newly opened. The photo above shows the just-scooped formula and how easily it melds to pressure. So, when I speak of ritual in application, it’s in this process of scooping and melting the face balm from solid to liquid that feels so nice with every application. While there’s no set rule on texture for face balms, there’s something for everyone out there. The creamier ones give you that cushiony soft feeling of being slathered in richness. The denser, solid-to-fluid balms allow you to further enjoy the annointing process. 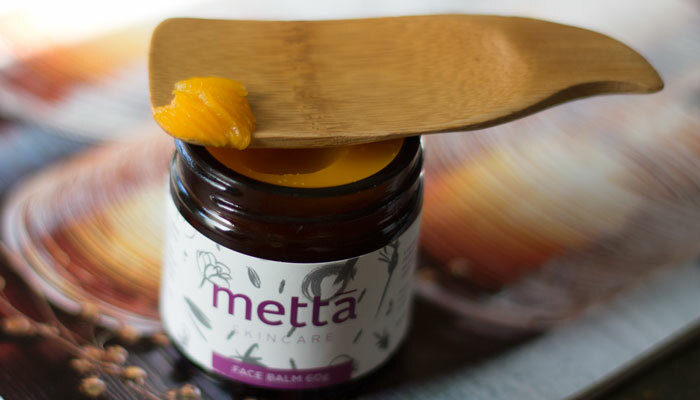 Whatever flavor you prefer, know that Metta Skincare’s Face Balm offers the deeply moisturizing experience you crave from a thick, dense balm, thanks to its formula rich in East African shea butter and cold-pressed oils of pomegranate, seabuckthorn and raspberry. I’m intrigued by this formulation and its inclusion of macadamia seed oil as the first ingredient. This oil doesn’t seem to be hyped much, but is so fascinating and beneficial. Macadamia seed oil is high in palmitoleic acid, a fatty acid that our skin loses with age. Used in combination with favorites such as olive oil, jojoba oil, pomegranate seed oil and red raspberry seed oil, macadamia seed oil adds an extra boost of skin-protecting antioxidants and moisture. Olive and jojoba oils keep the blend in a medium viscosity, cutting through thick, healing shea butter and beeswax. I’ve had wonderful, skin-softening results using this face balm both day and night. It never feels too heavy, and if I want a little extra layer of moisture, I can easily add a thin layer of face oil on top for a bit more glow. I’ve also used this face balm as a spot treatment to dry patches that need a little love, and it doesn’t disrupt my makeup or leave my shiny (remember, just pat it in!). The biggest appeal of Metta Skincare’s Face Balm? It doesn’t make any big claims beyond moisture. And with that, it exceeds expectations and has won my trust. 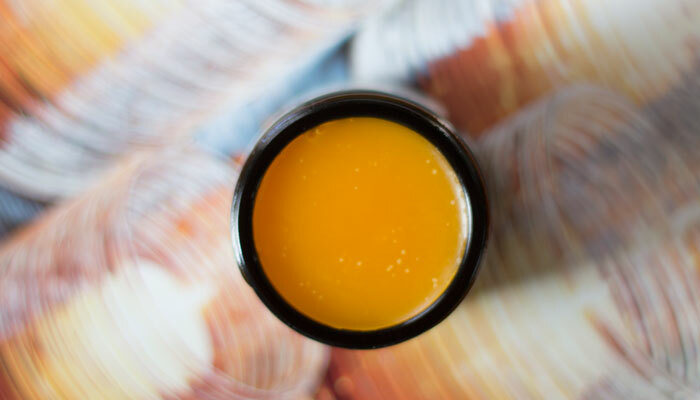 It’s simply a rich, soothing face balm that leaves my skin feeling better and looking healthy — at a very fair, affordable price. Well-done, Metta! You have yourself two new fans (yeap, the boyfriend approves, too!). What skincare ingredients grab your attention? What are your favorite heavy-duty moisturizers? Have you tried anything from Metta Skincare? Tell me more in the comments section!